And so that’s how I happened to score this awesome new half sheet pan. They told us we don’t even need to use parchment, or grease the pan in any way, food will just slide off. And wow were they right! I baked these scones and they literally slid right off when they came out of the oven! Huge thanks to USA Pan, and also thank you universe for putting me in their line of sight at the end of the day, ha! I can’t wait to bake up some cookies on this pan! These scones were a solution to my boredom with our regular biscuit routine. What I love so much about biscuits and scones is that I can do all the work in advance and freeze them. When morning comes, we can just pop them in the oven. I am not a morning person, to say the least. I made a double batch of these on a Friday afternoon to take a weekend our friends invited us out to their lake house. I thought these scones would be a savory start to build a stellar breakfast sandwich. Lake weekend we did scone + bacon + egg. Today I did scone + Boars Head Bold Peppernero Garlic Ham + egg. Scrumptious either way! Use good quality cheese and cream in these scones and you won’t be disappointed! *Side note: My “real life” job is a video editor. For fun I took a GoPro Hero Session out on our lake visit with friends. If you want to see the video I edited, check it out! Whisk together flour, baking powder, sugar, and salt. Add chives and Cheddar, tossing to combine. Stir in cream with a fork until a sticky dough forms. Turn dough out onto a lightly floured surface and knead 8 times with floured hands. Halve dough and form each half into a 7-inch round. Brush tops of rounds with additional cream and cut each into 8 wedges. 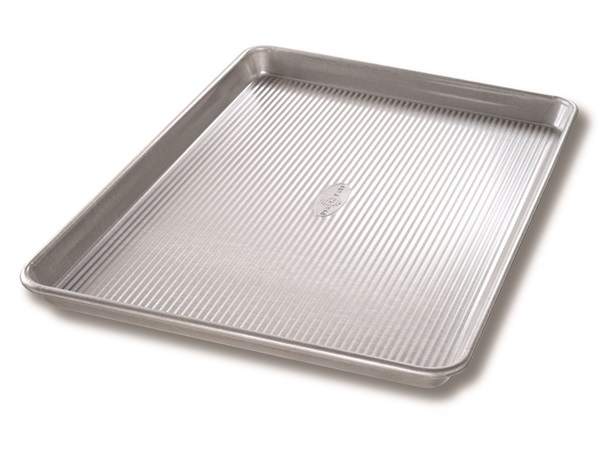 Disclosure: I scored the USA Pan baking sheet for free out of sheer luck. After just one use I already want more! The Boars Head company have no idea I exist, nor do they know I bought & endorsed their ham in this sandwich. I have an affiliate link to the GoPro camera I purchased & LOVE. If you’re looking for an action camera, but don’t want to shell out a ton of money, this one is only $200! Plus, I have experience with both this camera, and the Hero Silver 3+, and I honestly think the Session is much more consumer friendly and easier to use. I could talk your head off about it, so if you want more info, just leave me a comment and I’ll try to shoot you an email! Oh, GoPro doesn’t know I exist either. When I decided to make the Korean Barbecue Burgers I knew we HAD to have thin, fast-food style fries. Then, because the burger was so easy to prepare, I thought why not do a ketchup to compliment? This ketchup had the perfect flavor to pair with the fries and burger. Everything in the recipe is a pantry staple for me except the spicy gochujang. Believe it or not I found that at Target, which is where I went before stopping at the International Market where I had planned on buying it. We’ve made these burgers twice, and both times I made a quick batch of this ketchup. It really helps round out the meal. I’m already dreaming of when I can eat it all again! Whisk together ketchup, gochujang, brown sugar, soy sauce, garlic, ginger, and sesame oil in a small bowl. Use immediately or transfer to an airtight container and store in refrigerator for up to two weeks.